Totally pink & baby blue & mint green. All things Easter. 2. What's the first thing you add to your wardrobe in Spring? I usually am always looking for new sandals or for a new clean white and/or black t-shirt. Those are always harder to find than you'd think it should be. 3. 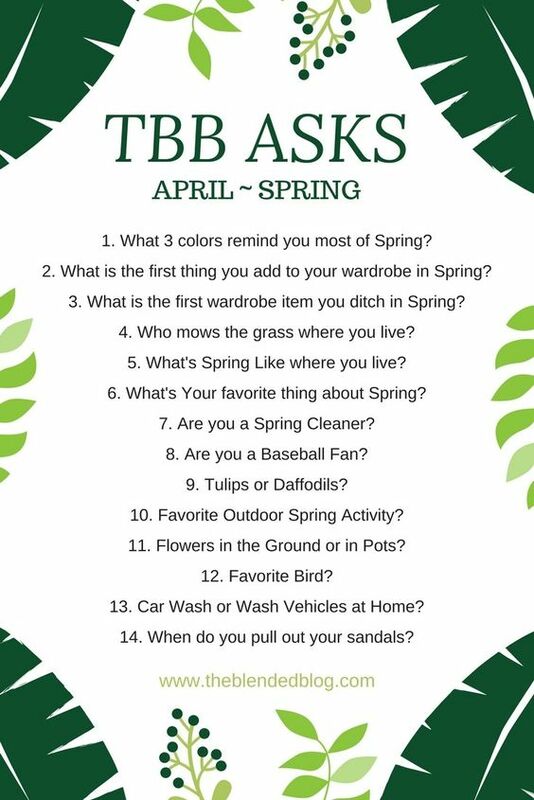 What is the first wardrobe item you ditch in the Spring? The hubs. Bless him. It's a chore. He usually breaks it down to a portion of the yard for each day - especially when it gets really hot. & the worse part, our fenced in back yard, we have to hand cut it (no riding mower will fit in the gates) & its the hilliest, hardest yard ever to cut. It's awful. I try to cut it every now & then but cutting the grass is how I tore my bicep tendon so I'm not good behind a push mower. Right now - still freezing. & usually, an allergy nightmare. Seriously, the Ohio Valley is known for its awful allergy season in Spring & humidity in the summer. Good times. Makes you want to live here, huh? More sunlight at night. Makes me come back to life. I seriously can hole up in the winter & never move or do anything. Spring gives me a spark back in my world. Meh... maybe... I get in spurts. Spring probably is when I clean the most because I love opening the windows & that fresh air inspires me to clean away for some reason. Nope. But to be fair, I'm not really any sport fan - except for tennis & running. I love me some tulips. So pretty to have a bundle in a vase. Reading outside. That counts, right? I love potted flowers on porches & in hanging baskets. I have no idea what its called - but we have a few birds that fly around here that are bright yellow & some that are bright blue. They are beautiful. Finches? I'm not a bird watcher so I'm not sure what they are. Usually when the temp hits 60's - I call it bearable - totally doable in the 70's - required 80's or above. I'm already loving the lighter evenings! Now if it will only STAY warm consistently. Your colors make me smile and reminds me of butter mints, lol. Reading outside absolutely counts! Love ya friend, be safe today, see storms in your neck of the woods. I prefer my flowers in pots too. The first to go in spring is the coat!!! Even though I rarely wear more than a hoodie even in the winter. Tulips are the best! We have a really hard yard to cut too. I cant wait to move! I just bought my first sandals of the season yesterday (even though it's still to stinkin' cold to wear them). Cute slip-on Sketcher's Go Walks...soft squishy soles with cross straps that look like denim with a floral accent. I have a feeling I'm going to live in them. I always look for nice new clean basic tees. It is the only time you can actually find them. I love tulips too. We have them in our garden. I enjoyed this post!! Sure seems like Spring is being illusive to many this year! I LOVE tulips! I can't wait to plant some bulbs in the fall so we can have them next spring. I was hoping we'd be surprised by some pretty flowers in our new home come spring, but nope. Nothing.